Bracknell, UK. 29th November 2016: Panasonic Computer Products Solutions (“Panasonic”) and B2M Solutions, a software company whose products deliver valuable insights and actionable analytics for enterprise mobility customers, today announced a best of breed collaboration to expand Panasonic’s service offerings. Powered by B2M Solutions, Panasonic’s Toughbook Smart Service, a scalable, cloud-based, Software-as-a-Service (SaaS) solution, will provide organisations with the unique ability to gather and analyse data from mobile devices and proactively manage the devices’ health and utilisation in real time. Delivering unapparelled visibility of a business’ mobile estate, Toughbook Smart Service will capture, aggregate, analyse and report on device behaviour enabling better utilisation and maximising the return on investment. The service will also monitor data on network performance, application usage, disruptive events and battery life to help identify productivity improvements and cost savings. The provision of full status visibility of each and every device enables businesses to identify under-utilised devices which can be redeployed to other parts of the organisation. Businesses can monitor WLAN data activity to identify high usage areas and applications which could impact on device performance. Mobile data can also be monitored and measured highlighting heavy-use applications and users, and enabling mobile data contracts to be increased if required reducing heavy data coverage costs. Mobile device performance analytics give companies a better understanding of applications installed on the deployed device advising them of which applications are being used the most and how this affects device performance and worker productivity. Continuous analysis of device behaviour and real time alerts notify the customer of statistically relevant events in real-time, offering unprecedented insight into device disruptions and reboots. These analytics will identify devices experiencing the most disruptions and reboots, review real-time feedback on software patches and bug fixes and isolate user issues versus software or hardware faults, thus reducing the number of ‘no fault found’ repair requests. Battery monitoring provides information on battery performance, discharge rates, charging cycles and life expectancy based on learned patterns. This critical information allows customers to discover root causes of rapid battery discharges, proactively resolving battery issues to avoid unplanned downtime and the resulting impact on productivity. Toughbook Smart Service software will be available both at point of sale and at any time during the Toughbook or Toughpad devices’ lifecycle. 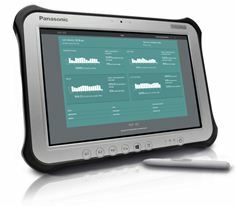 Available within Panasonic’s existing line of distribution channels across the European Economic Area, in English, French, Italian, German and Spanish, Panasonic Toughbook Smart Service software will also be available as a fully managed service with monthly reports provided by Panasonic, or as a self-service portal for an estate of devices.